Al Azhar mosque. A muslim prays. 1987. Worshiping The Creator comes in different forms. Some people sing, place their hands together, sit in silence, meditate or correspond with nature. For Muslims, there is an intricate pattern on the conduct of prayers. The Salat or the 5 daily prayers are performed following an established set of movements. This thousand-old tradition of prayer is infused with discipline. There is a certain art to which the Salat is performed. 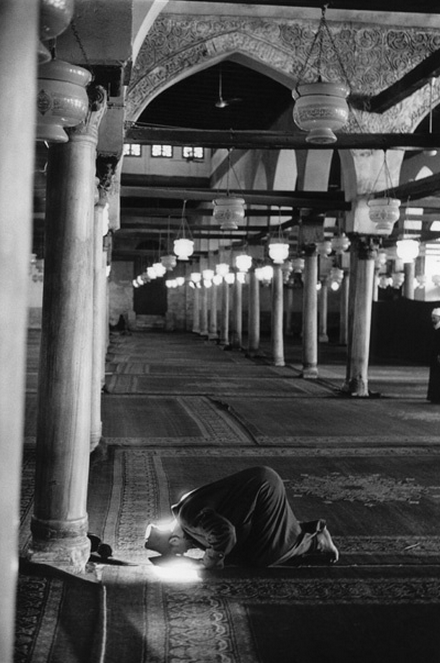 Perhaps, among all of the acts involved in the Salat, the most humbling one would be the sujood (as pictured above). Across different cultures, this specific human prostration is associated with obeisance and surrender to a greater being. People do it when they honor royalties, when they plead for mercy, or when they seek to please those who are essentially of a higher status than them. In Islam, the sujood is an act of prostration that signifies obedience not to any greater being but to The Greatest Being. It is an act of complete submission to God–and to God alone. It is an act of submitting to God who calls on people to live a righteous path, to be honest and honorable, to be compassionate, kind and just. It is a physical affirmation of the personal choice to submit to the Lord who is the best of all guardians and the most loving and merciful of all. When I look at that photo above, I imagine that person feeling a deep sense of peace and connection with God. As one bows down to God, one becomes elevated in his or her relationship with The Creator. In that specific moment, he becomes a true “Muslim” in the most literal sense of the word. The word Muslim means “one who submits to the will of God“. The sujood is a physical declaration–sort of like an oath–to which one affirms his or her decision to freely submit to The Creator. When you think about it, almost every person of faith, who chooses to obey God’s will, can be considered as a “Muslim”. A Catholic, for instance, who chooses to submit to God’s will becomes a “Muslim”. A person who meditates and shows compassion and kindness in his way of prayer can be considered submitting to God’s will– thus, becoming a “Muslim” as well. Although there are different religions and ways of praying to God, all of us still inherently share that fundamental desire to connect to The Most Supreme. We may have various ways of praying, but we all share that universal goal to reach out to God. I believe that in conducting our prayers, what matters more than form or tradition is our sincerity. Our sincerity–our honesty and devotion–marks the weight of our prayers–whatever form they may be.